Really liking this getting off at 7:00 on Saturday nights. I knew J and I were missing out on a lot. Now I’m really seeing that now that we can spend Saturday evening and all day Sunday together. I actually got off an hour early on Saturday night, so I was back in Kalamazoo by 7:00. Since it was still pretty early, J wanted to go to dinner and she told me we could just go for pub food since it had been a while since we had done that. About a month or so to go, I was driving down D Avenue in Alamo Township and came across an interesting looking restaurant. While the restaurant originally caught my attention, it was a sign near the edge of the property that was pointing to a bar that brought me back. 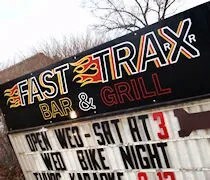 Fast Trax Bar & Grill is on D Avenue about a mile west of US-131. From the road, you don’t actually see the pub. What you see is the Club Car Restaurant. The bar is down the hill and behind the Club Car. There’s a sign out near the road that points you in the right direction. We followed the arrow down the driveway to another parking lot….which was really empty. The Club Car was pretty full, but no one was at the bar yet. I think J got a little nervous and she asked me if I was sure they served food. I told her I wasn’t 100%, but they did have the word “grill” in the name, so I was assuming so. We walked in to the bar to find it pretty empty. There were two guys sitting at the bar, the waitress, and the bartender and that was it in the building. We took a table near the bar just to make things easier. It’s not a huge space, but it’s obviously new. For a bar with no windows, it has a pretty bright feeling. Bars like this usually have a dark, dank feeling to the, but Fast Trax strayed away from that stereotype and brightened things up with green carpeting, light wood paneling, and a light grayish paint job. I know all of those things sound dark, but somehow, it makes the room feel cleaner, brighter, and more welcome than the typical pub. The menus were already on the table when we sat down and the bartender came over right away to ask about drinks. We both went with Oberon’s. I got the tall one which came in a large handled mug. J stuck to the small which came in a pint glass. 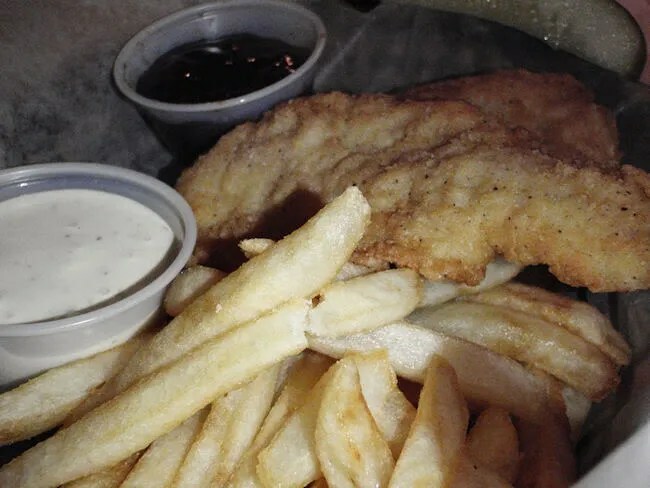 The menu is pretty small and sticks to pub food staples. Of course, I went with a burger. They have a couple choices and I chose Mel’s burger. Lots of meat on this one. It’s a half pound burger with turkey, ham and cheddar cheese. It’s served on toasted Texas Toast with the fixins on the side. The burger is fresh meat that was cooked so it was just slightly pink in the middle. 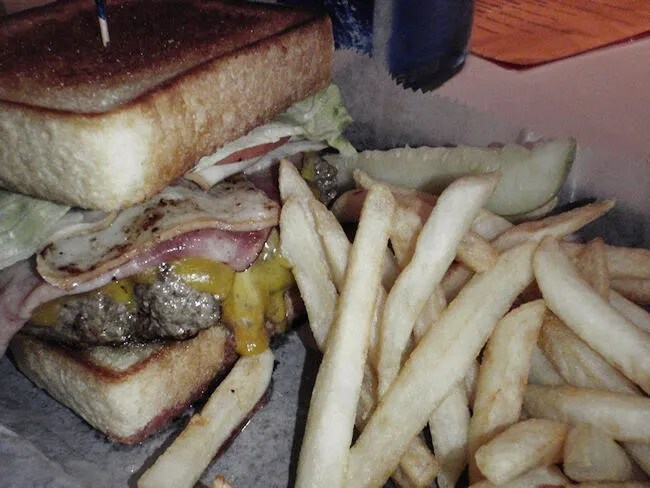 The burger was very juicy, but the Texas Toast soaked up those juices so they weren’t lost on the plate. The addition of ham and turkey didn’t get lost in the juicy grill taste of the beef. Instead, they added a slightly salty element to an already delicious burger. The sandwich came with skin on fries that were a perfect compliment to the sandwich. J wasn’t as excited about the menu as I was, but found a chicken finger basket that sounded good to her. She got four chicken strips and fries on her plate. She didn’t have a whole lot to say other than the chicken was a pretty standard frozen food service strip. She ate most of her plate, but left a few fries and a little bit of the chicken for me. Our bill was just a hair over $21 with the two beers. I was happy with the place and really enjoyed my greasy burger. J thought it was alright, but could have used a few more options on the menu. The place is pretty new to the area have just opened sometime since the first of the year. 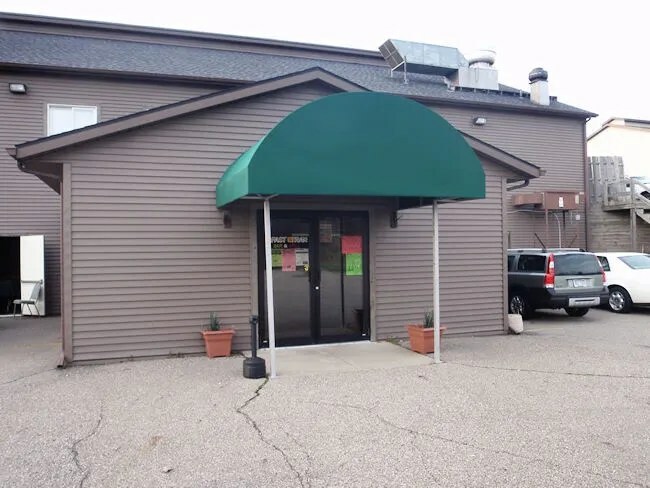 It has a pretty good location near the Kalamazoo Speedway (we could even hear the cars inside..that’s how close it is) and they do live music and karaoke at nights. For me, it would be a place I would eat again. It’s definitely a place I would drink again and it could be a post race stop some Saturday night if we ever make it to a race at the Speedway. FAST TRAX’S, THIS IS JOHN.M MANAGER OF THE PROBLEM CHILD BAND, PLUS I AM THE BASS PLAYER AND VOCAL’S, I WANT TO THANK YOU FROM ALL OF US TO COME AND PLAY FOR YOU ALL THIS FRIDAY NITE AND SATURDAY NITE. WE ARE LOOKING FORWARD TO IT. THANK YOU. WE ARE TRYING TO EXPAND OUR MUSIC AND SHOWMANSHIP, TO AS MANY PEOPLE AS WE CAN, WE ARE TRYING TO BE THE NEXT BAND OUT OF MICHIGAN TO MAKE IT, WE ARE ALSO PLAYING THE STURGIS TOY RUN THIS YR. WE ARE THE OPENING BAND. HOPE TO SEE YOU ALL THERE 8,9,10TH OF SEPT. WE OPENING UP THE 9TH THE FIRST BAND, COME ON DOWN AN HAVE A GREAT TIME. AND ONCE AGIN I WANT TO THANK YOU FOR LETTING US PLAY THERE. SEE YOU ALL FRIDAY. HAVE A GREAT DAY AND WEEK. WE’LL SEE YOU FRIDAY. THANK SINCERELY. JOHN.M MANAGER.